Make sure all the equipment is clean and dry when making meringue. First thing to do is drain the yoghurt - drain overnight by lining a wire mesh strainer with cheesecloth and place over a bowl. Put the yoghurt into the lined strainer, cover and leave in the fridge overnight. If your oven is not big enough to bake all three at the same time, make a third of the recipe at a time and bake each third individually. Preheat oven to 220 degrees C. Please baking paper on 3 large baking trays and by using the bottom of a 22cm cake tin draw 3 circles on each piece of paper. Beat the egg whites with the cream of tartar and salt until stiff peaks form. While the beater is still running add the sugar 1 tablespoon at a time until all the sugar has been mixed in and the meringue is thick and glossy. Sift the corn starch over the mixture, add the vinegar and mix well until combined. Scoop each third onto a drawn circle and shape the meringue within the drawn lines, keeping the top of the meringue quite even. Place in the oven and immediately reduce the heat to 150 degrees and bake for 30 minutes. Reduce the heat to 120 degrees celcius and bake for another 45 minutes. Switch the oven off and let the meringues cool inside the oven. Set a metal bowl over a large saucepan of boiling water, making sure the bowl does not touch the water. Place the sugar and zest in a food processor and blitz together until the sugar is a light yellow colour. Place the sugar mixture in the bowl with the butter, juice and salt and stir over the heat until the butter is melted and sugar dissolved. Slowly whisk in the eggs and continue whisking over the heat until the mixture thickens and coats the back of a spoon. Spoon into a bowl, cover and place in the fridge to chill for at least 2 hours. Melt the chocolate in a metal bowl set over a large saucepan of boiling water, making sure the bowl does not touch the water. Once melted, spread the chocolate evenly onto a piece of greaseproof paper. Cover with another piece of paper and gently press to release any bubbles. Roll the pieces of paper into a thin tube and place in the fridge for 2 hours to set. When you are ready to assemble the cake, unroll the tube and as you unroll the chocolate will break and you will have the shards to decorate with. 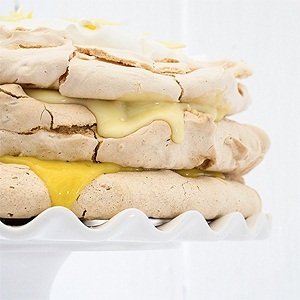 Place one meringue layer on a cake stand. Spoon over the other half of the lemon curd and spread evenly over the meringue. Place the 2nd meringue layer carefully on top. Spoon over the lemon & pistachio yoghurt and spread evenly. Place the 3rd meringue on top. Spoon over the whipped cream and sprinkle with the chocolate shards. The cake will hold its shape so you can make it before and serve after a meal as dessert but do not let it stand for more than 3 hours at room temperature. Reprinted with permission of HeinStirred. To see more recipes, click here.